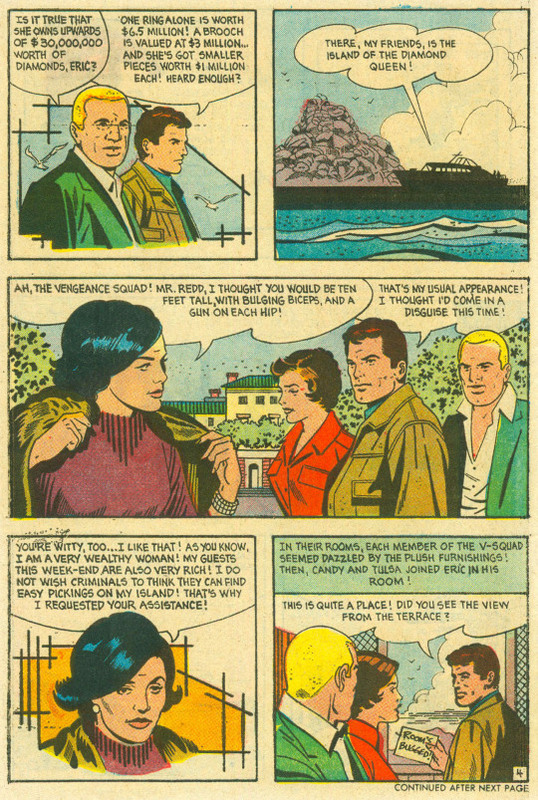 One more book from the Modern Comics 3-Bags reprinting vintage Charlton releases, VENGEANCE SQUAD was very much of a kind with a lot of Charlton’s output during the 1970s: it resembled a low-budget television show, it lacked in personality and individuality, and it was a bit shoddy and dull. The key thing that got it reprinted in this lot, I expect, was the Mike Mauser back-up story, featuring the character who had debuted in E-MAN earlier. VENGEANCE SQUAD was conceived and written by Joe Gill, a true workhorse in the comic book industry. For decades, Gill had churned out formulaic and undistinguished stories to fill Charlton’s titles for the princely sum of $2.00 a page. 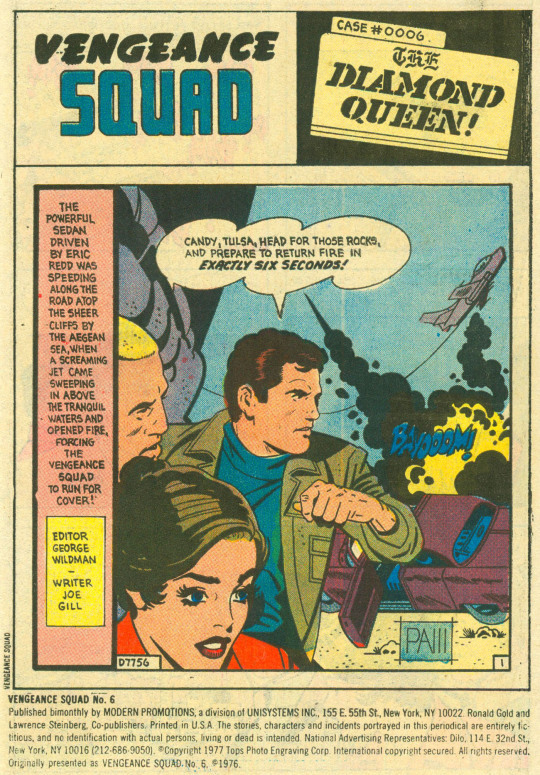 Given that rate, it’s a miracle that any of Gill’s comics make any sense at all, but he worked very much in the Robert Kanigher school of typing straight ahead in a single draft until you had filled the requisite number of pages. The one thing that made Vengeance Squad stand out at all was the artwork of PAM, a.k.a. Pete Morisi. Morisi was a New York policeman who augmented his income by moonlighting drawing comic books for Charlton–hence the pen name PAM. 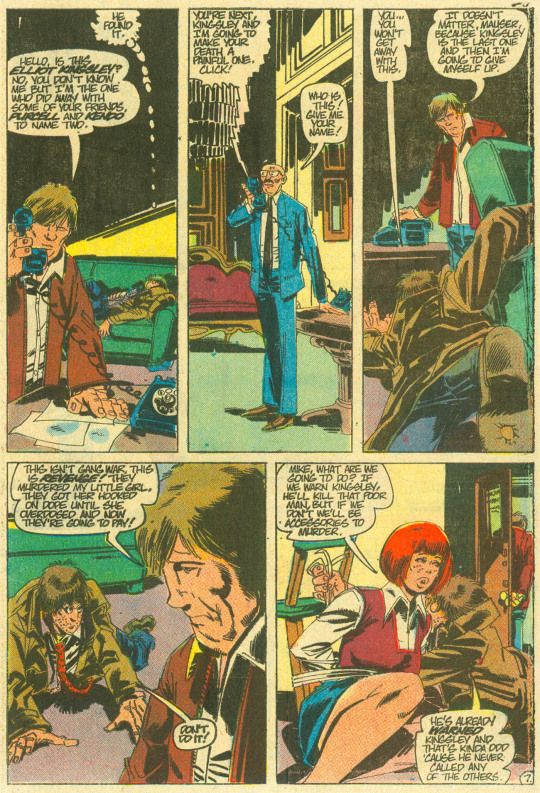 He had a style strongly influenced by Alex Toth, very stripped down and pulpy. But in Vengeance Squad, Gill doesn’t give him anything interesting to draw, and so page after page just looks dull and lifeless, a lot of medium shots of characters standing around talking. PAM was a good artist, and what he did elevated the material–but not enough in this case. The Vengeance Squad is made up of Eric Redd, Candy Orr and Tulsa Coyle. It’s a bit unclear just what they are–a special police squad, mercenaries, spies. In any event, they’re in the freelance bad-guy-catching business. And here, they’re ambushed by a fighter jet on their way to the Island of the Diamond Queen, where they’ve been summoned for a job. 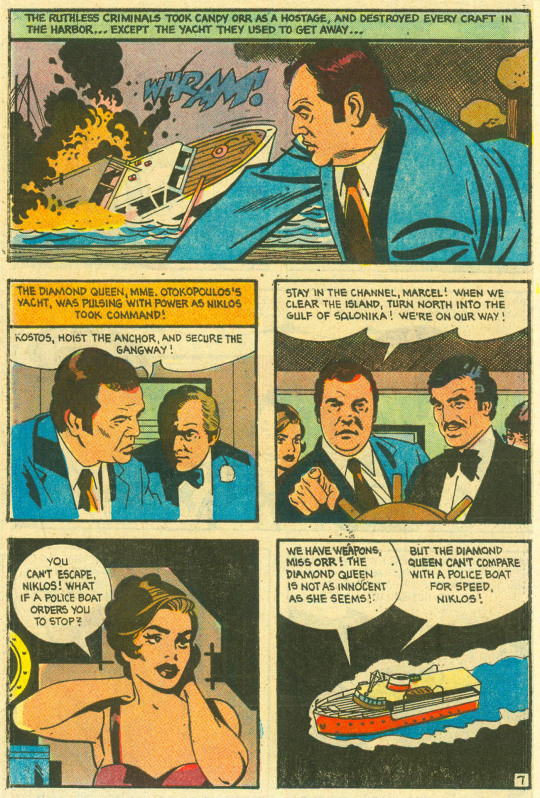 The V-Squad swiftly shoots down the plane with handguns (!!!) and then continues on to the island, where Mme. Otokopolis wants their protection during a party she’s throwing for her wealthy friends. And the party is hit by criminals, who drug the guests, rob them, and take Candy along as a hostage. 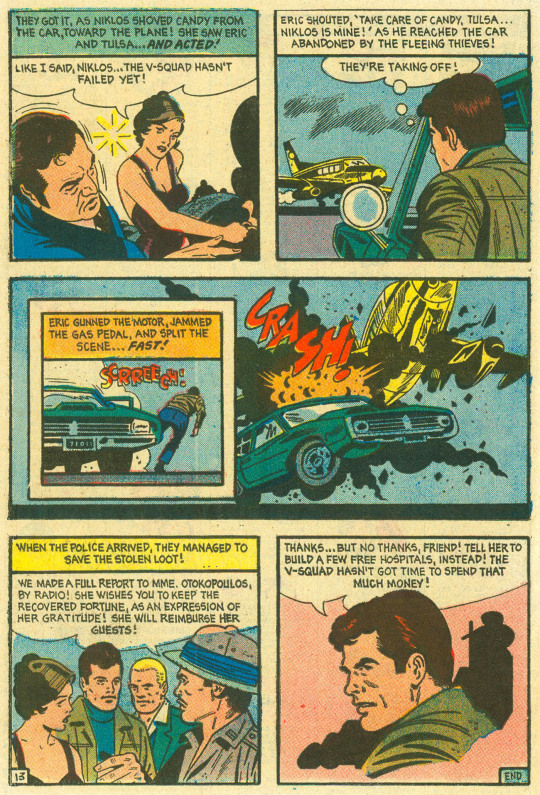 Eric and Tulsa pursue, in a very languid and unspectacular chase sequence, eventually bringing the criminals to heel. And Eric even refuses the offer of a reward for the team’s actions–so it seems like they aren’t mercenaries after all. If there’s any excitement to be found in this story, it’s well hidden. But the artwork is appealing to look at. 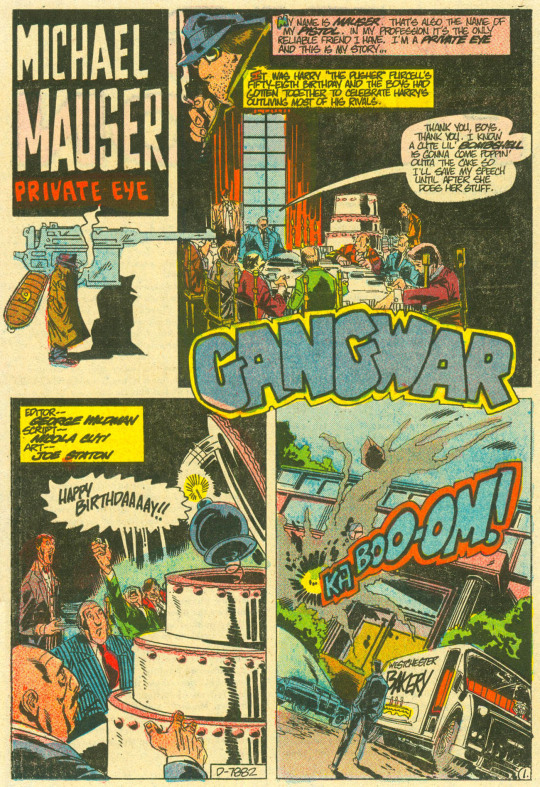 As mentioned earlier, the back-up story stars Mike mauser, Nicola Cuti and Joe Staton’s sleazy private eye from the E-MAN series, here the headliner. It’s got a million times more energy and liveliness to it as the opening tale. Across the city, top mobsters are being killed mysteriously. Mauser gets involved when he’s pulled in to fill out a police line-up, and one of the other guys in the line-up takes him out for a drink afterwards, and promptly tranquilizes him. Turns out, he’s the one killing mobsters, all of whom were involved in a drug ring whose product his daughter had overdosed on. He’s on a quest for vengeance, and Mauser has the information he needs to find the last person on his hit list. Thereafter, he’ll give himself up. Mauser has to wrestle with whether he should save the drug kingpin or not–and, of course, he winds up doing so, shooting the would-be killer and causing him to fall off the roof. It’s a fun story in that it plays with the typical hard boiled private eye conventions, but because of the art style and the whimsical approach, doesn’t take them all entirely seriously.